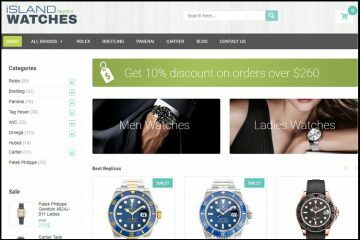 Precisely because there are so many replica websites out, it has become a necessity to know how to differentiate the trustworthy merchants from the unworthy ones. 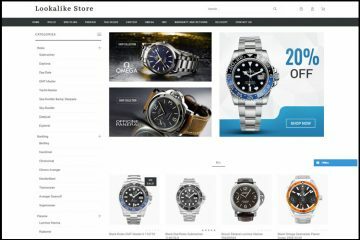 Listeprecisetime.com promotes itself as a reputable source of high end replica watches, bust as we very well known in the replica world facts speak louder than words so let’s test its potential. Listeprecisetime.com has the appearance of a common website. Its wide menu and banner make it look more like a blog and less like an online store. I have to admit that its design is not that bad, but it’s not that flattering either. Its advantage is that it manages to keep its aesthetics very simple with basic functions and with a black and white color scheme- making the overall webpage seem very friendly and easy to browse. Still, what’s inside is more important than looks so let’s take a closer view at the company’s products and policies. The menu is incredibly short. It includes only 6 watch brands. 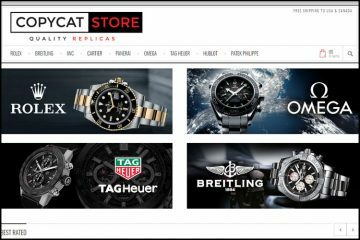 As we all know, appearances can be deceiving so do not think, not even for a moment, that this online merchants has such a limited selection of replica watches. The reality is that its collection includes far more products. 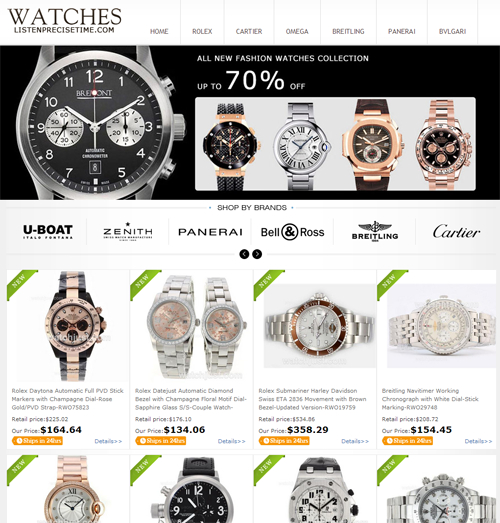 After you click on one of the categories from the top menu bar you will see a very long list of watch brands in the left side of the page. From Tag Heuer to Ferrari watches, from Audemars Piguet to Longines, or from Omega to U-Boat, here you will find the best-selling watch models ever made. In case you were wondering, the replica watches equipped with a Swiss mechanism cost about $300-$500 while the Japanese watches cost about $150. Also, what I liked about the website is that the product description page is very nicely constructed and it presents complete and thorough information about these replicas. The packages are shipped with EMS and the shipping fee is about $20. All orders are sent with a tracking number that can be used to trace the package throughout the shipping process. Usually, the company needs about one or two business days to prepare the order for dispatch. The delivery time for packages sent to Europe is about 5 to 7 business days while packages sent to USA, Australia, and most South America countries take about 10 business days. The company provides a 14 days return or exchange policy. So this basically means that you have two weeks from the moment you receive the replicas to contact the company and request the return information. You also need to know that all the costs of returning the items need to be covered by the customer. Also, a $20-$40 shipping and handling fee will be deducted from the refunded amount. My advice is that you should put in balance all these costs before deciding to return a replica and decide if it is really worth the trouble and effort. Each brand is divided into sub-collections with the same name as the original collection name. This helps us very much to browse through the items and find the desired model. Unfortunately there is no option to sort or filter the replicas by price or design particularities, not even by movement type. 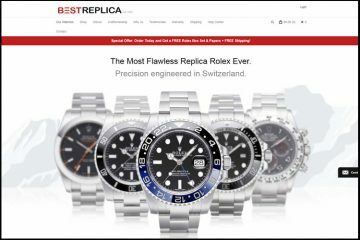 This is very bothering as on Listeprecisetime.com you will find both Swiss and Japanese made replicas- and these cannot be viewed separately. You simply have to browse through the hundreds of models listed on the website. Even though on the bottom of the page and in the Order Submission Form the website claims to accept Visa and Mastercard payments, the truth is that Visa is the only accepted credit card payment. Only after you hit the Submit button and it loads the payment processing page you are revealed that you can pay only with a Visa card. This is a very unfair way of conducting business because some visitors who only own a Mastercard may spend hours trying to decide what watches to purchase and upon checkout they will discover that they have wasted their time as they do not possess a Visa card to pay for this order. Customer service: Unfortunately Listeprecisetime.com is unable to provide its customers with reliable customer services. The website even has a chat button on the home page, but surprisingly enough this is just for show. The only thing that happens when you click it is that it takes you to the Contact page where the only option you have of contacting the company is either by email address at [email protected] or by Contact Form. No phone number is available for direct and immediate assistance. Summary: Just like any other online replica company, Listeprecisetime.com tempts us with a very large collection of beautiful replica watches equipped with either Swiss or Japanese automatic movement at very affordable prices. Additionally, it provides fast worldwide delivery and a 14 days return policy. All these sound very nice and almost too good to be true. Sadly, there are a couple of things that make us hesitant about purchasing a replica watch from this company and these things are: it only accepts Visa cards even though it claims to process Mastercard as well, it charges a restocking fee, it is unable to offer a reliable customer service and its pictures are not an accurate representation of its actual stock.